The human body is a natural organism. It was created from the “dust (or clay) of the earth”. Therefore, the perfect food for the body will also be of earthen origin ─ unaltered. Unaltered resources that qualify as real food include such things as clay, water, algae, seaweeds, herbs, fruits, nuts, seeds and vegetables. 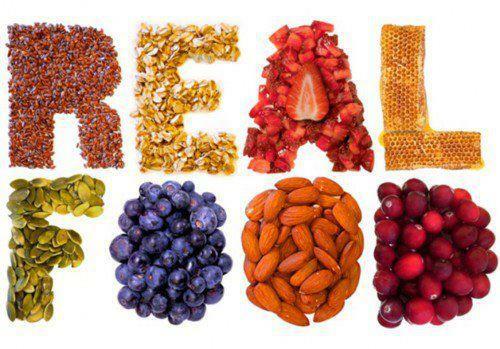 Anything less than whole would not be a “real food”. This includes “natural” vitamin and mineral supplements assembled by a laboratory rather than by Nature. Our job is not to try to improve on Nature with our so-called “science”, our job is merely to provide the body with an abundance of real food and let the body decide what to do with it. Whole unaltered foods contain a vast array of nutrient-based building blocks for the body to select from and decide what to do with them. It is also our job to not toxify the body with foods that are not real or compatible with the human body and to detoxify all that is foreign and poisonous. In this manner, the body will have the greatest freedom to select from the vast array of resources that we provide in order to simply clean house and build life-giving strength. Again, this entire process is performed, not by our manipulation of chemical reactions, but through our support of the body’s own inherent wisdom. There is nothing more compatible, or more effective, than the right combination and quantity of whole unaltered food resources to give the body exactly what it needs to restore health. Clearly, lifestyle changes, shifts in internal perspectives and improvements in diet will be required as well to insure maximum results, yet any movement in the “whole unaltered food ” direction will propel you toward this ultimate goal.